Last month, Michigan's lame-duck session legislature passed a host of bills, many controversial, especially Right-to-Work legislation. There are numerous political and economic reasons why it happened, particularly when it happened, but the fact is that moving forward employers in Michigan are now free from compulsory union membership...and a lot of people are still pissed off about it. Today, Right to Work (RTW) opponents were riled up because they hate RTW. It just so happened that RTW has been tied to something they like ("Pure Michigan" ad campaign) in a full page ad that ran in the Wall Street Journal and it gives them to talk about how much they hate RTW. This latest bout of outrage from those who opposed RTW has prompted MLive to ask "Is the 'Pure Michigan' brand being misused?" Here's the ad in question. "The perfect storm of opportunity, resources and passion is Pure Michigan.” - The Horror. 1. The Pure Michigan campaign has been an effective tool in boosting state tourism and consequently has become a very recognizable and valuable brand. 2. One of the goals of the new Right-to-Work legislation along with expanding liberty is to improve the economic climate in Michigan. It is one less obstacle to doing business. 3. The Wall Street Journal is one of the most read and respected news outlets in the world, particularly in business circles. #4. If you are going to promote Michigan as open for business with an improving and welcoming business climate, then the Wall Street Journal is one of the top places to place such an advertisement. #5. Using the already well established and highly recognized Pure Michigan campaign also makes total sense because A) It's already a well established and recognizable brand & B)You don't have to spend additional time and tax dollars coming up with an entirely new campaign. #6. Those who oppose the Right to Work legislation, particularly unions, don't want Michigan's economy to bounce back and grow while RTW is the law of that land and any credit can be given to its impact. This uproar demonstrates that unions and their political allies are not eager to change and become relevant in the 21st century. Some are so resistant to change and eager to maintain the old status quo, that they'll happily destroy the Pure Michigan brand, hinder Michigan economic growth and tourism industry as a means to repeal the law. Further divisiveness will be driven be RTW opponents, not supporters. #7. That RTW opponents seem willing to destroy the Pure Michigan campaign to even a political score is more despicable than the MEDC using it's most recognizable brand to encourage investment and new jobs in the state which is a big part of the MEDC mission. The recent Right to Work legislation is merely one more selling point to new businesses and not the only one listed in the ad. 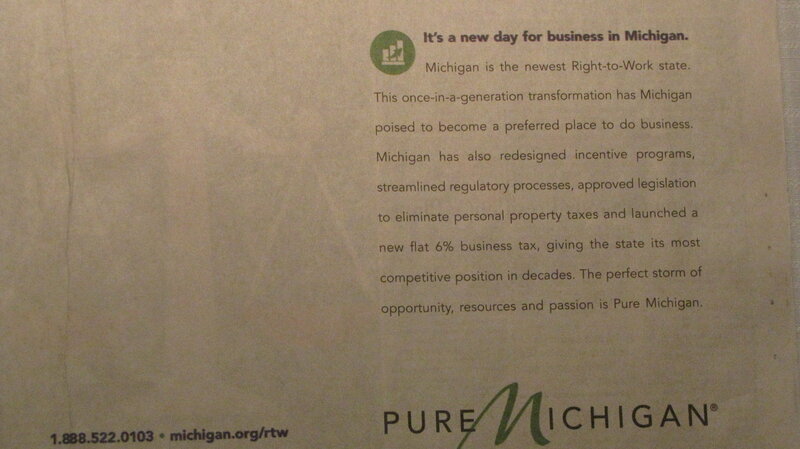 Michigan will move forward because of increasing opportunity and passion - RTW is a part of that. Moving forward. Not backward. That's Pure Michigan.